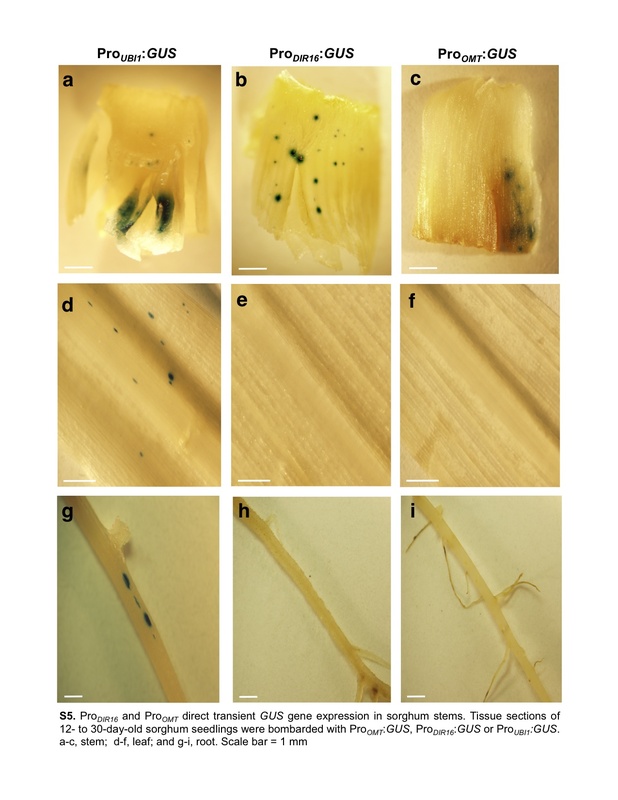 Transcription profiling analysis identified Saccharum hybrid DIRIGENT (SHDIR16) and Ο-METHYLTRANSFERASE (SHOMT), putative defense and fiber biosynthesis-related genes that are highly expressed in the stem of sugarcane, a major sucrose accumulator and biomass producer. Promoters (Pro) of these genes were isolated and fused to the β-glucuronidase (GUS) reporter gene. 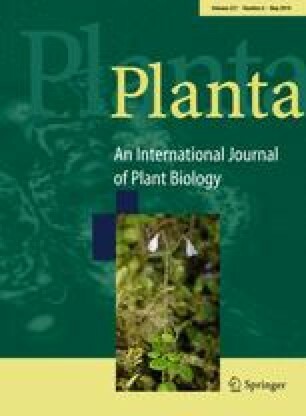 Transient and stable transgene expression analyses showed that both Pro DIR16 :GUS and Pro OMT :GUS retain the expression characteristics of their respective endogenous genes in sugarcane and function in orthologous monocot species, including rice, maize and sorghum. Furthermore, both promoters conferred stem-regulated expression, which was further enhanced in the stem and induced in the leaf and root by salicylic acid, jasmonic acid and methyl jasmonate, key regulators of biotic and abiotic stresses. Pro DIR16 and Pro OMT will enable functional gene analysis in monocots, and will facilitate engineering monocots for improved carbon metabolism, enhanced stress tolerance and bioenergy production. The online version of this article (doi: 10.1007/s00425-010-1138-5) contains supplementary material, which is available to authorized users. We are grateful to members of the Thomas Laboratory at Texas A&M University for discussions of results, data analysis and support. We specifically acknowledge Dr. Andrew Tag and Rick Hammer for bioinformatics support. We also thank Dr. Madhurababu Kunta (Citrus Center, Texas A&M University-Kingsville) for assistance in photography, and Brennick Langston (Texas AgriLife Research, Texas A&M System) for sequence submission to NCBI and determination of the three-dimensional structure of sugarcane O-methyltransferase. This work was supported by grants from the Texas Grain and Grass Gene Initiative Program (No. 06-0001), the Rio Grande Valley Sugar Growers Cooperative and Texas AgriLife Research, Texas A&M System.